​It's A Crisis Of Infinite Woodys In Valiant-Sized Quantum & Woody #1! The original superhero odd couple, Quantum & Woody, will face their biggest challenge since their recent reboot in December's Valiant-Sized Quantum & Woody #1, when a giant asteroid is on a collision course with Earth. And that's before Thomas Edison accidentally brings a Woody from an alternate dimension to "help." Written by Tim Seidell — best known for his ridiculously popular, undeniably nerdy Twitter handle BadBanana — this massive, 40-page one-shot includes a short tale from regular Quantum & Woody comic writer James Asmus, and both feature art by Archer & Armstrong's excellent Pere Perez. 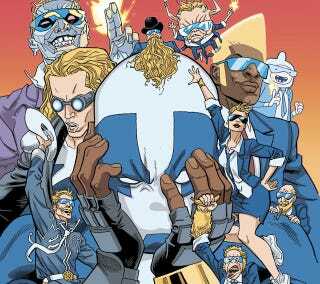 We spoke with Siedell about what crisis could possibly be so catastrophic it would make an international team of heroes think letting lowing Quantum & Woody join them was a good idea. io9: What can readers expect from this "Valiant-Sized" Quantum & Woody adventure? Tim Seidell: Quantum and Woody are called upon to save Christmas (oh, and about seven billion human lives, give or take). A giant Earth-crushing asteroid is heading this way, forcing an uneasy alliance of international and interpersonal foes to put aside differences and work together to save mankind. Quantum and Woody join forces with Edison, as well as a North Korean superhero and a rabidly anti-Semitic, but otherwise genius, nuclear scientist. This is Earth's hastily-assembled Dream Team (or Nightmare Team, depending on how you look at it). It's a story so big it can't be contained on one Earth. Why on Earth would any team of superheroes let Quantum and Woody anywhere near them? Seidell: Edison and the other scientist are the brains of the operation. Unfortunately, their plan requires the special powers of both Quantum and Woody. I think everyone involved would have been much happier if that wasn't the situation, but time is short and you have to do what you have to do sometimes. While everyone is trying to be a hero here by saving the planet, there's really only one other superhero, and she's a product of North Korean military experimentation. She's been training for this day for many years. Quantum and Woody, however, have not. Why does Thomas Edison open a dimensional portal? Does he think another Woody could possibly help the situation? Seidell: Oh, dear lord, no. Edison can barely stand the thought of one Woody, let alone multiple Woodys. The dimensional portal is put to emergency use in a way Edison had not originally planned, with consequences he could never have predicted. What can you tell us about the alternate-dimension Quantum and Woody? Seidell: In some ways, they are very similar. Okay, only in how they look. In all important ways, Other Woody is pretty much the exact opposite of our Woody. Would our Quantum be more or less likely to get along with the alternate-dimension Woody? Seidell: We answer that question rather directly. And, not to give away too much, but if you've ever wanted to see Quantum and Woody throw down in an epic, brother-on-brother, superhero fight to the death, you might want to pick up this issue. With the original '90s continuity comic sequel Q2: The Return of Quantum and Woody due out soon as well, what's the odds of seeing the original Christopher Priest and Mark Bright Woody In this thing? Seidell: Let's say there are billions of other dimensions out there. Many, no doubt, contain Other Quantums and Other Woodys. The odds that a version of the original Woody is out there, somewhere, are pretty good. Which are far better odds than him appearing in this particular issue. Sorry. Top cover by Chip Zdarsky; lower variant cover by Mike Hawthorne.